Today we're releasing the final version of V6 (6.56.118). This version has lots of changes, but the two most important ones are: projects hierarchy and a new permissions system. Previous versions of Team Password Manager had a simple permissions system based on granting access to an element (project or password). We've revampled this model and made it more powerful. Now you have many different type of permissions (in projects and in passwords) that will allow you to, for instance, revoke access to an element, give more than one user/group manage permission, and more. 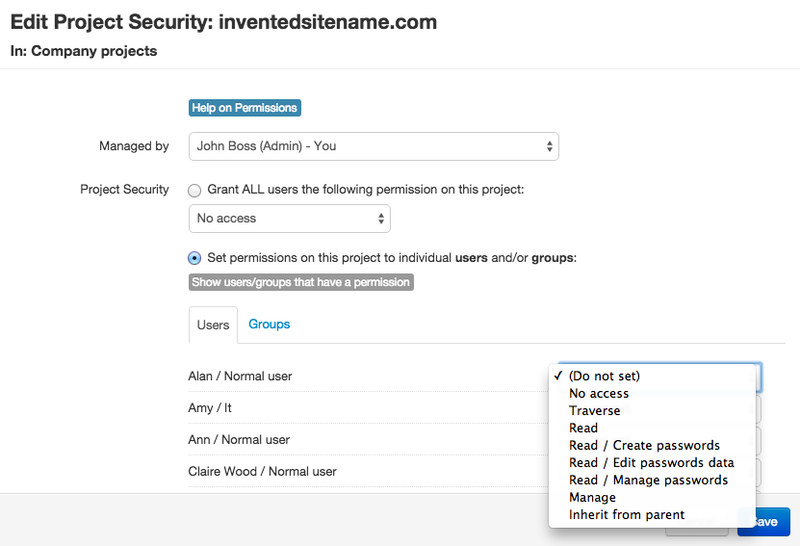 Note that this new permissions system also works with the projects hierarchy: you have a permission type called "Inherit from parent" that will give the user/group the same permission it has in the parent project. External sharing is disabled by default. An Admin/IT user must enable it in Settings | External Sharing. To take full advantage of the new projects hierarchy and permissions model we've developed a new API version (4). API v3 also works with this model (with limitations) but it's marked as deprecated and will be disabled in future releases. API v1 and v2 no longer work with V6. These are the main changes in V6, but you can see the list of all of them in the changelog. V6 has been a huge development for us. It has required lots of trial and error, testing different things, frustrations, coffee and nights :-). This is not an excuse, but an explanation of the delays in its release. So we apologize for them. At the same time, we'd like to thank you for all your support and encouragement.